NEW LISTING - PLENTY OF UPGRADES!!! Both Main Engines Were Completely Rebuilt At The End Of 2016 And Have Approximately 20 Hours As Of September 2017. Below is a short list of some major upgrades in Late 2016 and Early 2017: - New Vetus Bow Thruster. - All New AC Pumps and AC Units, Control, etc. - All New Batteries and Cables. - Teak Floors Redone. - New Windlass. - New Exterior Hull Paint. - All New LED Lights Throughout. - Custom RGB Lumitec Lighting Exterior (Blue) - Custom Lumitec Spectrum X Underwater Lighting (8 Lights That Multi-Color) - Both Main Engines Rebuilt With New Turbos From The Bottom Up By Authorized MANN Dealer. - 1000 Hr MAN Service Just Completed. - Props Refinished. - New Underwater/Bottom Paint. - New 13" Simrad Navigation Systems. - GenSet Just Serviced. - Rebuilt Sea Water Pumps. _______________________________________ Great 2 Stateroom Layout With Full Beam Master! In terms of luxury, quality, and flat-out performance, the Sunseeker 56 Predator set the standard for big sport yachts during her 2000-2004 production years. The Predator boasted an array of sophisticated features including a hydraulic swim platform for launching and retrieving a tender as well as an optional hardtop with retractable sunroof. 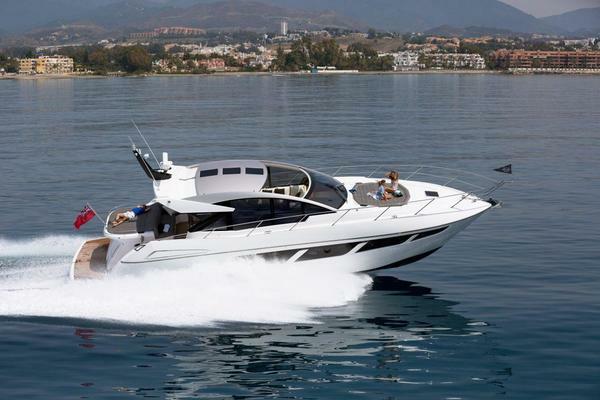 Her expansive, wide-open cockpit is still among the class leaders for comfort and amenities, and the Predator is one of the few European sport boats whose engine room offers decent service access. Additional features include a teak cockpit sole, wide side decks, and cockpit engine room access. Many Extra Upgrades: - All brand new soft goods including curtains, throw pillows, and bedding. - Wine cooler/cocktail refrigerator & 6 bottle wine rack. - New HD TV - Salon & Master. - New Samsung Blue-Ray player – Salon & Master. - Flatscreen Panasonic with built in DVD player – VIP. - Hydraulic lift and full launching platform. - Teak-laid bathing platform and steps. - New speakers and stereo/Blue Tooth in cockpit. - Deeply upholstered seating for up to 8 around cockpit table (new onyx table top). - Full cockpit Eisenglass with inserts andretractable top canvas. United Yacht Sales New Jersey would love to guide you through a personal showing of this 56' Sunseeker Predator Hard-top 2000. This yacht for sale is located in Myrtle Beach, South Carolina and priced at $348,000. For a showing please contact us by filling out the form on this page and we will get back to you shortly! Full cockpit Eisenglass with inserts andretractable top canvas (new Sept 2014).